José Vilson teaches middle school math in the Inwood/Washington Heights neighborhood of New York, NY. His book, This Is Not A Test: A New Narrative on Race, Class, and Education, stormed the heavily guarded gates of the education reform debate, battered them down, and made people sit up straight and listen to a social justice teacher about what our children and schools need. This video for the book More Than a Score features interviews with several of the book’s contributing authors. Below is José’s important reflection on the book I edited, More Than a Score: The New Uprising Against High-Stakes Testing–and his thoughts on the movement that so many of us are building to defend and transform public education. 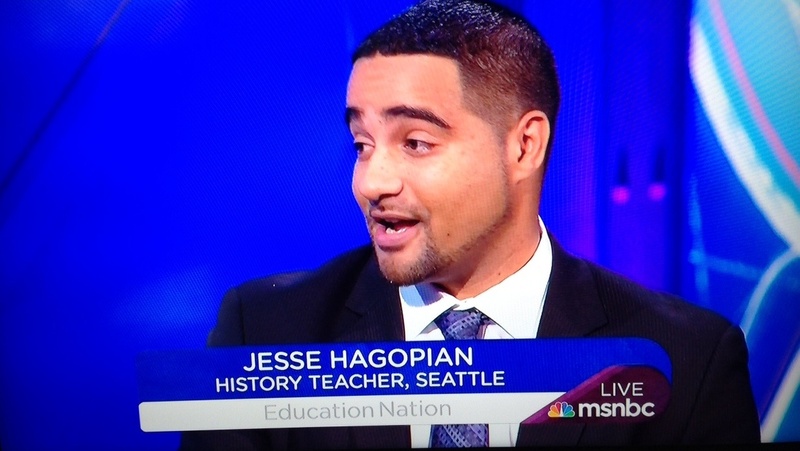 In the spring of 2014, a few books dedicated to the “Education Spring” revolt came out from various publishers, one of which was mine, and the other was More Than A Score, a collection of stories edited by Jesse Hagopian from numerous dissidents from across the nation. [Full disclosure: Haymarket Books came out with both of our books). As I consider many of them colleagues in this work (and some of them friends), I was happy that so many of them got to tell their story. So why a review from me almost a year later? Simple. As any of the activists in this volume can tell you, these stories are still relevant to the work of moving the profession forward.I read these chapters in the authors’ voices. I was intrigued by Rosie Frascella and Emily Giles’ story of co-leading the charge to have her entire Brooklyn-based school opt out of unnecessary exams, much to the chagrin of NYCDOE and the United Federation of Teachers. I was enthralled by Barbara Madeloni’s vision for a new education system, including racial dynamics as part of her call to activate. I recalled Karen Lewis’ ascension to the leader of Chicago edu-resistance, envisioning how they organized for better schools and not just a better contract for teachers. Stephanie Rivera’s chapter on becoming a future student reads as a precursor to the ways she’s currently managing the school system as a rookie teacher. John Kuhn’s tale of resistance in perhaps the most reform-friendly state in the nation rang of hope. I laughed aloud at the chapter co-written by Cauldierre McKay, Aaron Regunberg, and Tim Shea of the Providence Student Union, who resisted their state’s education reforms through creativity and art, two ideals that their legislators sought to reduce by overtesting their students. Folks like Helen Gym, Nikhil Goyal, Brian Jones, Malcolm London, Mary Cathryn Ricker, and Jia Lee also turned in chapters worth having in your back pocket. This read like a call to reframe the notions of “the civil rights issue of our time,” coded language to tap into the imaginations of black folk, and consider we’ve already been here with standardized testing. This is the path towards connecting the education resistance movement to black lives mattering. In Brian Jones’ chapter, he talks to friend and Chicago activist Xian Barrett how he deals with questions of inequity and why some parents have bought into the current education reform structure. His advice: “When parents raise those difficult issues, that’s when you have to deepen the conversation.” The aforementioned chapters do just that. This is truly what is meant by nuance, and I’m thankful for these folks, not just in their writing, but in their works. Let’s move. FairTest’s “Testing Reform Victories 2015” Report: The uprising against the testocracy takes off! Praise indeed from our ally Mr. Vilson. Congrats Jesse. I miss seeing you around the CB schoolhouse.